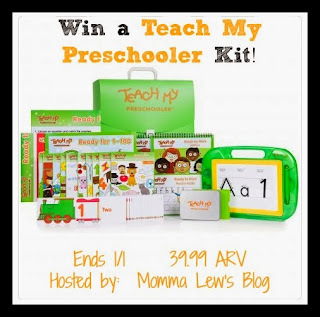 My Life According to Pinterest: Teach My Preschooler Kit Giveaway! Hosted by: Momma Lew's Blog Sponsored by: Teach My Thank you to Squishable Baby & From ABC's to ACT's for Co-Hosting this Giveaway! My Life According to Pinterest and a group of great bloggers are excited to bring you this great giveaway! Teach My Preschooler is an award-winning all-in-one learning kit for children ages 3 through 6. Read Momma Lew's full review here to find out more about this great kit! One lucky reader will win their own Teach My Preschooler kit (ARV: $39.99). To enter, follow the steps in the Rafflecopter below. Giveaway is open to US residents, 18+, one entry per household. Winners have 48 hours to claim their prize and all winning entries will be verified. Giveaway will end on 1/1 at 11:59pm EST. a Rafflecopter giveaway Good luck & Thank you for entering! By making it creative & tying it into things we do daily & my kids can relate to. My daughter is still little (2 right now) so we practice colors, shapes, counting, ABCs with her books and puzzles. I do colors while painting her nails or coloring with crayons.